A couple of month’s back I painted and reupholstered an accent chair for my Great Room (seen here). 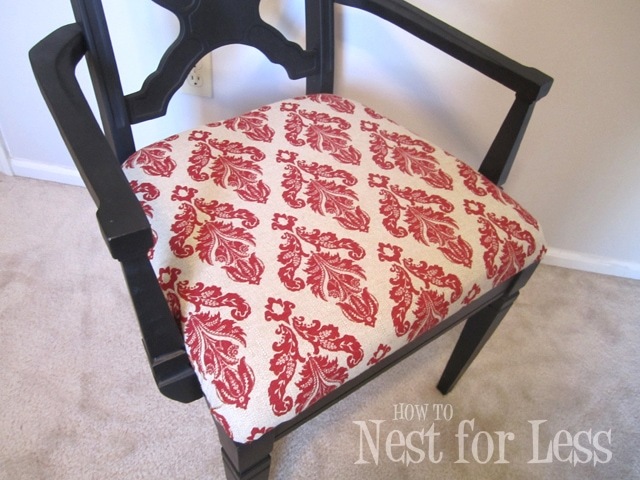 While I liked the fabric choice and color, I didn’t think that the chair provided enough POP for the room! Over the weekend I was at Hancock Fabrics while they were celebrating their 54th Anniversary with a HUGE sale! 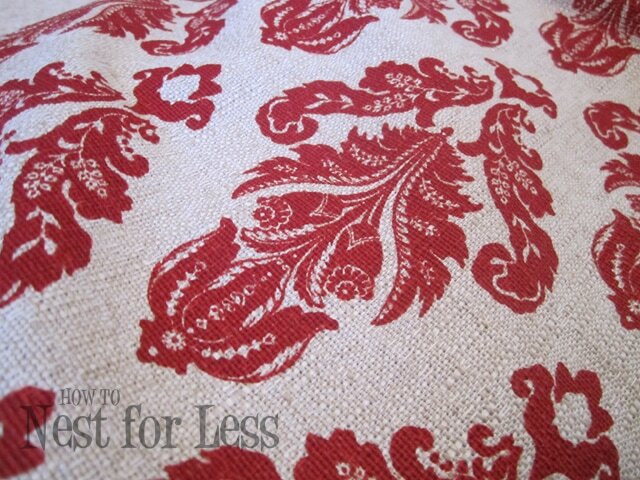 I found some amazing red damask burlap fabric for only $4 a yard. Yeah, a little hard to pass up! I knew this would be a quick and easy project. 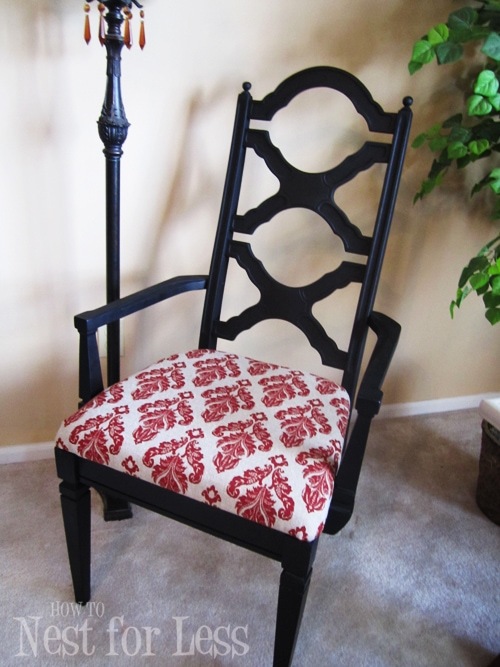 I wanted to keep the frame of the chair black, just reupholster the fabric. I unscrewed the seat from the chair, pulled off the old fabric and removed the staples. I measured the new fabric to make sure the pattern aligned correctly (I actually had to look up the fabric online to make sure I was attaching it right side up; it was a confusing damask!). Then I stapled it into place and screwed the seat back onto the chair base. Well, what do you think? SO MUCH BETTER, right? 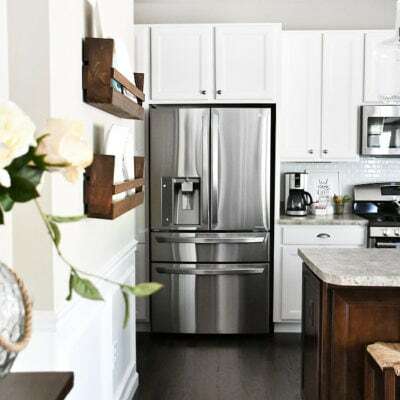 It gives me that pop of color plus the modern look and feel to go with the rest of my house. I’m in LOVE. And who wouldn’t be with a $4 makeover? LOVE that fabric! It’s a great pop of color and classy at the same time. Great work! You did wonderfully! The colors work very well together! Looks great! I love the graphic black and white with red. I love it! I hit up the same sale too and got some foam for an upcoming project 🙂 Great job! I’m your newest follower! Love the red! 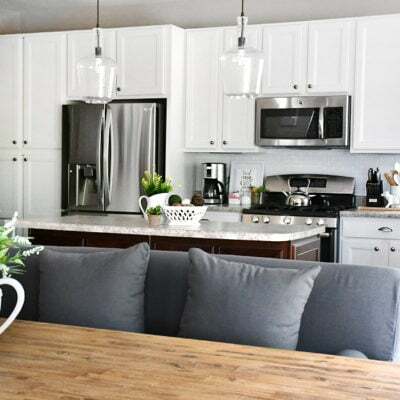 This is a great makeover!!! Good job. Ahh! I Love, Love, Love this chair! Oh man…its just gorgeous. I’ve never recovered a chair, but this makes me want to! I love that fabric! Great choice! Love it! I think the fabric choice goes with all seasons and gives a nice pop of color. Thanks for the tutorial! 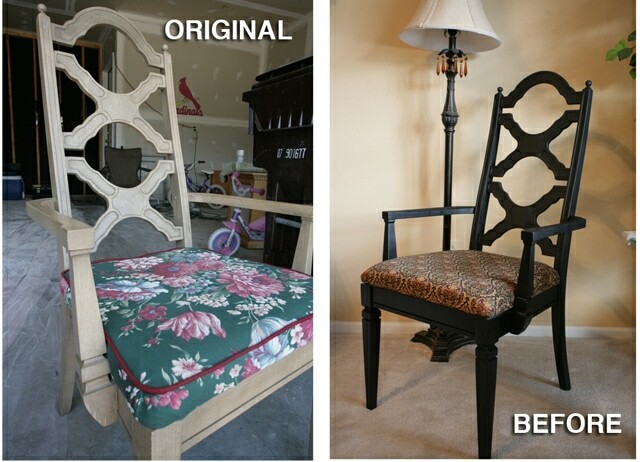 I was looking for a blog post about chair recovering because my dining table chairs are WAY overdue. I feel unconfident, though. DO IT!! It’s super easy to do and makes a huge difference! love it! so much more vibrant now! Great fabric choice! Love it! 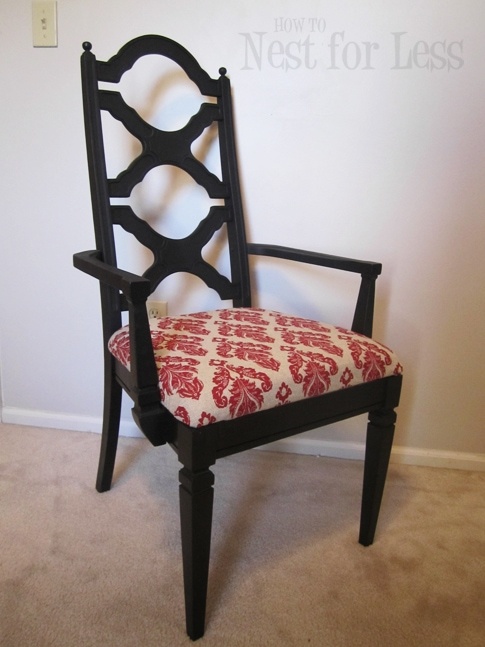 Love the style of this chair, it’s beautiful! Looks amaziing and I LOVE the fabric you picked out this time around. Love the colors! Red, black and white are my favorite. That fabric is beautiful as well. Very nicely done. I absolutely love the fabric. I have been searching high and low for something just like this. Do have the name of it- or a number or anything to point me in the right direction???? Thanks so much! Here is the fabric from an online source. 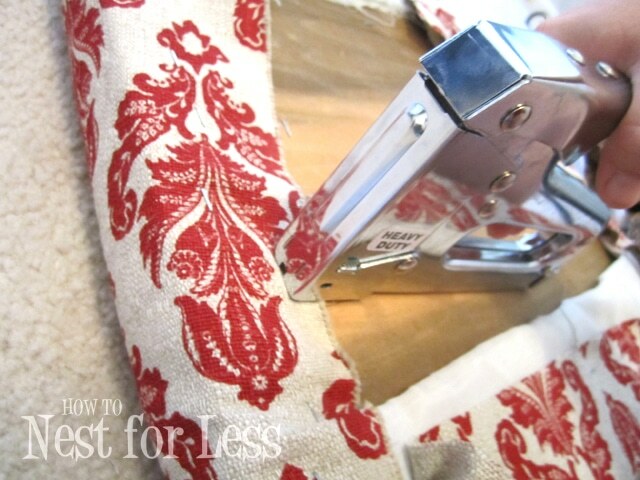 http://www.thefabricco.com/product/5621/Red-Damask-Curtain-Upholstery-Fabric.html. I actually got it from Hancock Fabrics on sale for $4 a yard. HOPE THAT HELPS!! Your chair is beautiful and I love the fabric you chose. 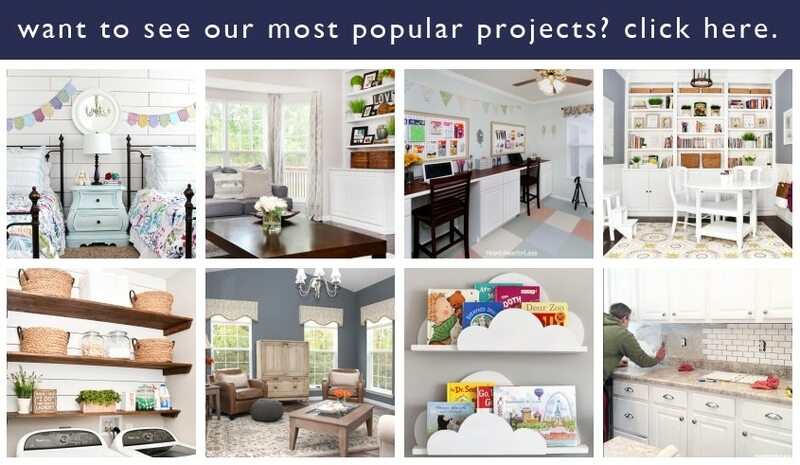 Thank you so much for sharing at Savvy HomeMade Monday! Love the chair makeover. I will be featuring it tonight at my Fall into Fall party that opens at 8pm EST. Please stop by and pick up an I’ve Been Featured button. Thanks so much. The chair looks amazing! I love black furniture, I am transitioning into making all of mine black. 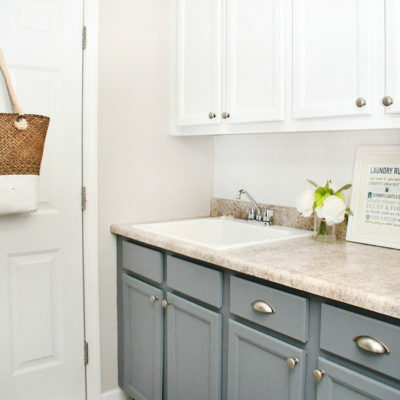 And I have been dying to find some great burlap fabric to make accent pillows for the living room and guest bedroom! I live in AZ and I have tried looking at Ross and Marshalls, but the pillows are still $30+ 🙁 I’m still on the hunt, though! Keep on crafting, I love everything you do! I LOVE IT…. JUST WHAT I WANT TO DO WITH MY DINNING SET!! Yay, so glad to hear! Good luck with your makeover.